Our wildest visitors, the Bennett's Wallaby, were introduced to Waimate from Australia in 1874 for the fur trade. Our dry environment and sweet bush suited the marsupials, and their numbers quickly ran into the thousands. Like many introduced species, wallabies threaten our native environment. Their feeding depletes native bush, forests, farm pastures and crops, and the tussocky highlands. They're popular game for hunters from around New Zealand and all over the world. They’re hunted on foot, from helicopters, and from vehicles, and there are also regular poison drops by the Department of Conservation. 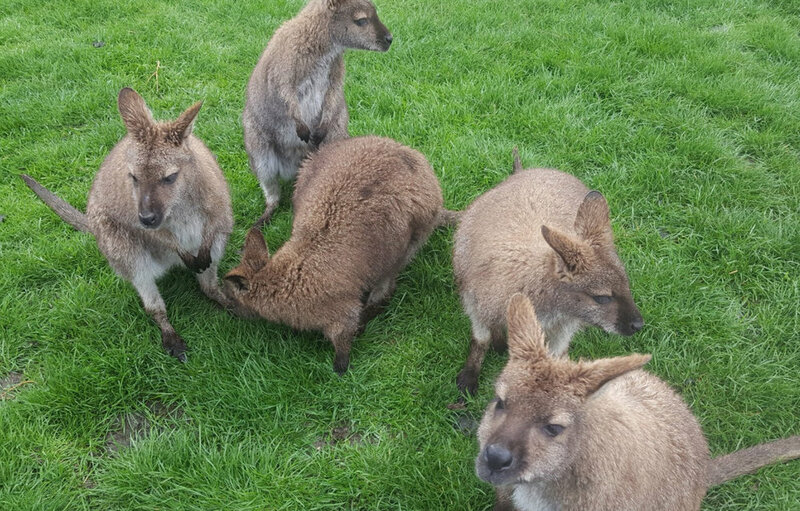 You can see live wallabies in the enclosure at Victoria Park, Waimate, and at Tame Wallabies at EnkleDooVery Korna, where wallaby whisperer Gwen Dempster - Schouten nurtures the animals. You will often spot wallabies in the wild on our many walking tracks.